A gaping rift in the Larsen C ice shelf is growing every day, leaving just a few kilometres of ice holding an iceberg twice the size of the ACT from floating away. Larsen C sits on the western edge of Antarctica like an icy dam, holding back the glaciers on the land behind it. Researchers have been watching the shelf closely after the collapse of the Larsen A ice shelf in 1995 and the sudden break-up of Larsen B shelf in 2002 – both were thousands of years old at the time. Another large cleft has appeared in Larsen C in recent days, suggesting it could disconnect entirely in a matter of days or weeks. It would be the first time Larsen C has collapsed in over 10,000 years. The obvious assumption might be that a warming Earth melts the ice and breaks it apart, but the reality is a bit more complex than that. Still, with a breakaway event looming, it seems important to ask what makes an ice shelf break free, and what does it mean for the broader climate system? Some of the most direct indications of what is happening to Larsen C come from the calving of its brother, Larsen B, which splintered and collapsed in just over a month in 2002. At the time, researchers had never witnessed such a large area - 3,250 square kilometres - disintegrate so rapidly. The collapse of the Larsen B has been linked to a series of warm summers on the Antarctic Peninsula, culminating in an exceptionally warm summer in 2002. Warmer air temperatures caused significant surface melting, which creates melt ponds that drip down into any small crevasses and prevent them from sealing properly. This causes fissures that can reach right to the bottom of the shelf, and eventually cause the shelf to splinter. Additionally, warmer ocean temperatures in the Weddell Sea during the same period caused thinning and melting on the underside of the ice shelf. With compromise occurring on both sides of the shelf, even strong winds and waves could flex the shelf, adding to the runaway break-up. When Larsen B broke, the icy debris field it left in Larsen Bay began to drift away with the currents, leaving the bay completely ice free every summer since. While particularly cold winters still occasionally fill the bay with sea ice, it is no substitute for the Larsen B shelf and its influence on the glaciers that once fed it. 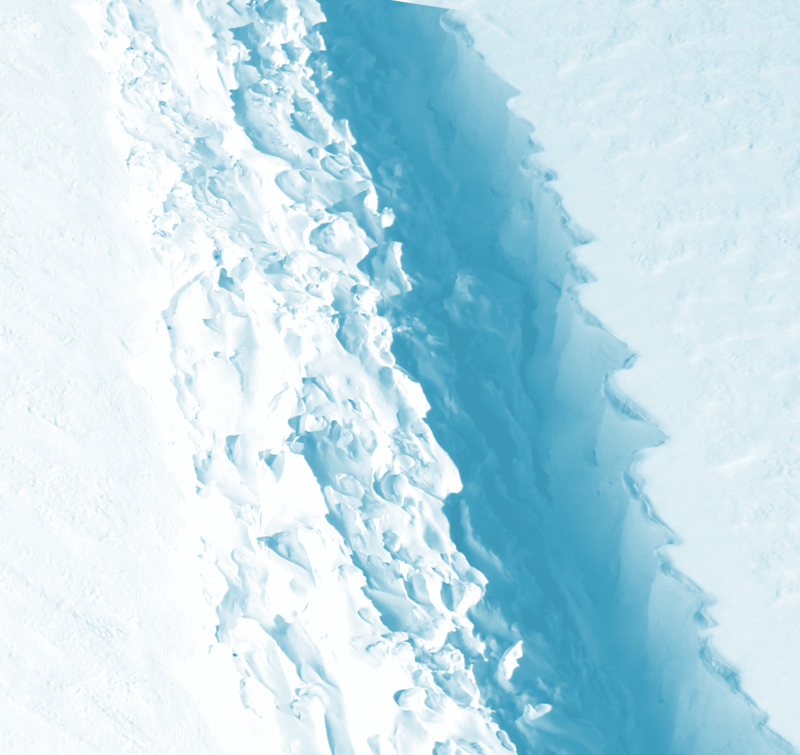 Without the pushback provided by the giant shelf, the glacier’s slide into the ocean has accelerated. Now in 2017, a similar series of events is playing out, with melting ponds appearing on Larsen C and research showing warmer oceans are wearing away at its underside too. Additionally, the British Antarctic Survey has discovered for the first time the role that warm, dry winds play in influencing the behavior of Antarctic ice shelves. The team found that warm spring and summer winds, known as ‘föhn winds’, are actually more frequent than previously thought, and are likely to be a contributing factor in weakening the ice shelves before a collapse. With spot evidence like melt ponds and of course the giant visible crack increasing, and trend-based threats like the fact that the amount of days with above zero temperatures on Antarctica has increased over 60 years, scientists are confident that a big break is looming. So what does it mean for the Antarctic environment, and the rest of the planet? As it is already floating, the enormous iceberg that breaks off Larsen C will not raise sea levels. However, it could lead the rest of the shelf to continue breaking up, resulting in glaciers flowing more rapidly off the land and into the ocean. This would have an impact on sea levels. What it really represents is a single image of a progressively changing system. While the giant ice sheets of Antarctica and Greenland hold the majority of the world’s frozen water, it is actually the cumulative impact of the melting of many smaller glaciers that will drive sea level rise. Research suggests ice melt from small glaciers and ice caps will account for about 60 per cent of sea-level rise attributed to melting ice, an estimated 10 to 25 centimetre rise by 2100. These calculations do not include the expansion of warming ocean water, which could double the rise.